My buddy Joe Bishop is a pretty fair hand with a rifle, a naturally better field shot than I will ever be. Joe is good enough I kinda hate to shoot in front of him, but sometimes it’s unavoidable—such as when we pitched up in southern Russia to hunt the Kuban tur. We took a Russian jeep to the end of the road, horses from there, but before we saddled up, we checked the rifles. Joe fired first, his strike about two inches high, perfect. I was shooting a Blaser R8 with a Zeiss scope, a reliable setup, but now it was the moment of truth. I fired, and my strike was within a quarter-inch of Joe’s. We were ready to go hunting. There was some luck involved, but there was some guesswork, too. Joe lives in the Rockies, so he sighted in at an elevation of about 7,500 feet—similar to where we were in the Caucasus. I sighted in at sea level, but I cheated. Knowing I was going into thinner air, I zeroed a bit lower than I normally would. Fast forward to Nepal’s Himalayas, with the same scope and same rifle. We helicoptered to a village at 10,000 feet, where we checked our zeroes. One shot was enough. My strike was a bit less than two inches high at 12 o’clock—right where I wanted it since I knew we’d be hunting much higher than where we were. If I’d missed it wouldn’t have been the rifle’s fault. But I didn’t. On the hunt in Russia, I took a gorgeous Kuban tur at 450 yards and a Caucasian chamois at half that distance. 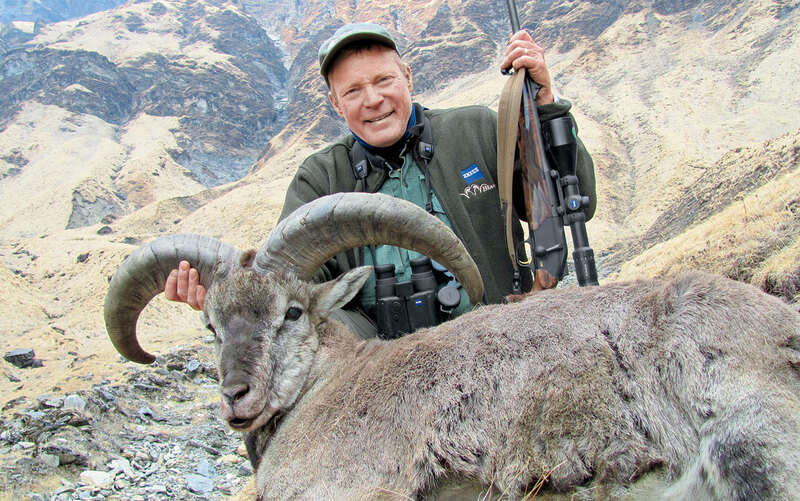 In Nepal, I took a fine Himalayan tahr at 465 yards and a fantastic blue sheep at 510. Three out of four of these shots are somewhat farther than I usually write about—and farther, given a choice, than I prefer to take. However, for this article they’re important because capability starts with a correct zero, and confidence flows when you know your zero is right. 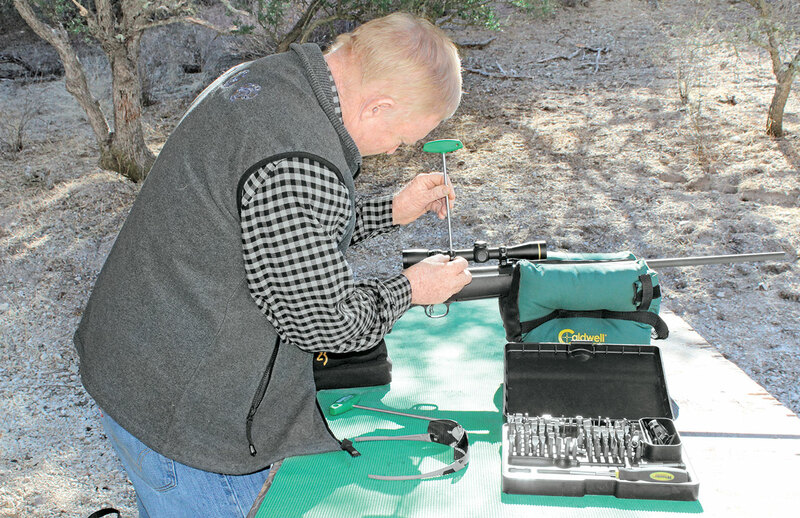 Step one in any zeroing process is ensuring all scope-mounting hardware is properly secure. Before you start shooting, make sure all screws are tight: action screws, scope mounts, scope rings. With that accomplished, it’s time to get the sight roughly in line with the bore. You can use a collimator or some other bore-sighting device, and depending on your rifle, you may have to. For bolt actions, I prefer to do it the old-fashioned way: removing the bolt and, with the rifle rested solidly on sandbags, peering down the barrel at a target, preferably a round bullseye. Center the target in the barrel, then with the rifle anchored, look through the scope. Adjust the reticle until it’s centered on the bullseye. If your rifle action doesn’t permit this method and you don’t have a bore-sighting device, your only course of action is to start at very close range and fire at a big target. For some applications, there’s nothing wrong—and a lot right—with a dead-on zero at 100 yards. “Point of aim, point of impact” is as simple and effective as it gets. It is often said a 25-yard zero is the same as 100 yards. Folks, this is simply not true with scoped rifles. Because the line of sight is higher than the line of bore the bullet must rise (because the barrel is angled slightly upward in relationship to the scope) to reach the line of sight. It’s still climbing at 25 yards. 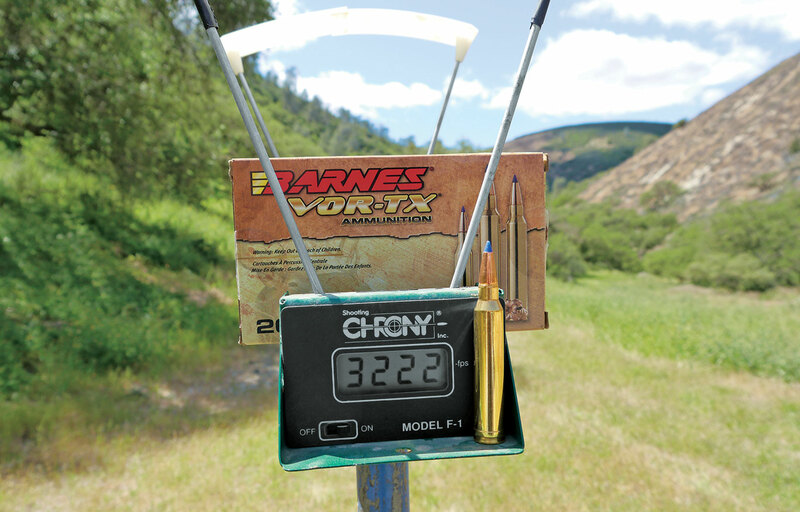 Dead-on at 25 yards is usually much too high at 100 yards. Zeroed correctly, most flat-shooting cartridges in scoped rifles will cross the line of sight for the first time somewhere between 40 and 50 yards. Normally, I get on paper and achieve a rough zero at 50 yards, which gets me closer at 100 yards. Shorter distances are perfectly okay for getting on paper, but with a scoped rifle there is no substitute for sighting in at 100 yards. At this distance you’ve reconciled the height of the scope over the bore, and slight errors in windage or elevation—which might not show up at close range—will be apparent at 100 yards. Chronographs are a vital tool for determining what a particular load does out of your rifle, providing a baseline for generating accurate ballistic data. Beyond that point it curves downward, crossing the line of sight again at some greater distance. Ballistics charts will provide all this information, at least approximately. For greater accuracy, you must chronograph your load in your rifle. Armed with that information, the ballistic coefficient of your bullet, height of scope and pertinent climatic data, you can use one of numerous computer programs to determine your trajectory curve. The big decision to be made when sighting in is exactly where you want your bullet to strike at a known distance. With today’s interest in long-range shooting, it seems increasingly common to sight in a bit higher at 100 yards. “Dead-on at 300 yards” is common, and I’ve seen guys afield zeroed for 400 yards. The problem is the farther that second crossing of the line of sight, the higher the mid-range trajectory. Two things make this a problem. First, the most common aiming error is to shoot too high. Second, if you’re serious about long-range shooting, it doesn’t matter where your rifle is zeroed: At some distance, you’re going have to raise your elevation. When that point is reached, trajectory is just a number, and you must know the number. In most circumstances, I like to sight in just a bit high at 100 yards so I can shoot reasonable distances without holdover. However, I don’t like to sight in too high at 100 yards because I fear the mid-range trajectory rise. Why? Because strikes on game are often higher than they should be. Honestly, how many of us really concentrate on the lower third of the chest? And how many of us take the safer shot at the larger target, the center of the chest? All too often, I’m in the latter group, especially as distance increases. Also, it isn’t uncommon for the lower parts of an animal to be obscured by vegetation, driving us to a higher hold. Halfway up from the brisket line, either on the shoulder or just behind, is perfectly fine—but you don’t want to go much higher because, as a friend likes to say, there isn’t much up there. Here’s a good example of what I’m talking about. Take a 180-grain .30 caliber bullet with a reasonably high ballistic coefficient of .425 and push it at 3,000 fps from a fast .30. For a 200-yard zero you sight in 1.5 inches high at 100 yards. You’ll be a bit higher at 150 yards, but not high enough to get you into trouble. You’re already down 6.8 inches at 300 yards, time to compensate. I can live with that. Take the same bullet at the same velocity and sight in for a 300-yard zero. You need to zero 3.8 inches high at 100 yards, and at 200 yards you’re 4.5 inches high. In other words, at the middle ranges you’ll need to hold lower than your intended strike. I have a terrible time making myself do this. There are a few cartridges that shoot flat enough that allow a 300-yard zero without a dangerously high mid-range trajectory. The fastest 6.5mms (.26 Nosler and 6.5-300 Wby. ), .270 Wby. Mag., the fastest 7mms, and the fastest .30s fall into this elite category. But for most cartridges, a 300-yard zero causes a mid-range strike that’s too high for my taste. A 400-yard zero is just plain out of the question. With our same hypothetical load, you must be 6.5 inches high at 100 yards—and you’ll be almost 10 inches high at 200 and eight inches high at 300. Don’t even think about it. So what’s a good solution? Jack O’Connor, who hunted before there were laser rangefinders or computer ballistic tables, advised hunters to sight in between two and 2.5 inches high at 100 yards and be done with it. Depending on bullet speed and BC, with reasonably flat-shooting cartridges the O’Connor “formula” will put you dead-on between about 200 and 250 yards. Somewhere around 300 yards you’ll have to raise your hold, but you won’t need to worry about holding low in the middle ground. For most shooting, that’s fine. With a flat-shooting non-magnum cartridge like the .270 Win., I get as close to 2.5 inches high at 100 yards as I can. With the .30-06 it depends on the bullet weight and the purpose, but I never sight in higher than O’Connor suggested. There are also times for specific sight ins. For leopard hunting over bait, for instance, you really should verify your zero before getting into a blind. While you’re doing it, you might as well adjust your zero so you’re dead-on at the exact distance from blind to bait. That’s a nerve-wracking shot, and you don’t want to second-guess yourself. People who shoot at longer ranges have a lot more to consider. For instance, if you are using a trajectory-compensating system, whether a reticle with stadia lines or an adjustable turret, things are a little different. 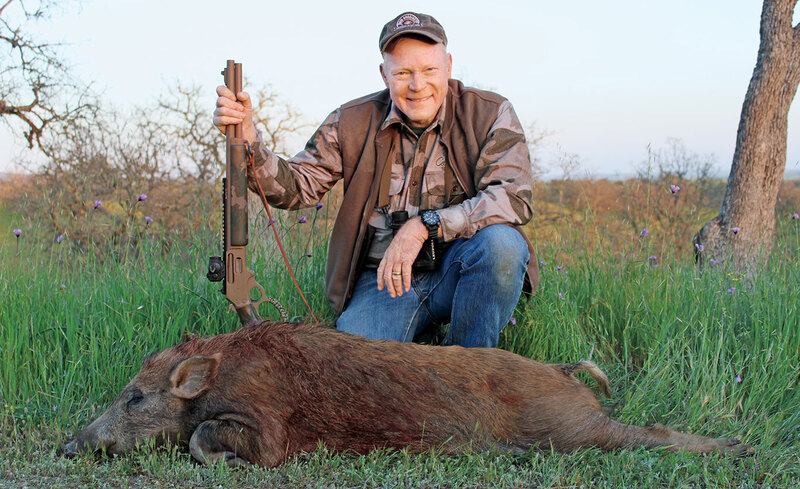 Most manufacturers have proprietary systems, and I have used Leupold’s Boone & Crockett reticle and the Zeiss Rapid-Z a great deal, and for the last couple of years, I’ve mostly used Leupold’s Custom Dial System. While systems differ, they all require a known starting point. Shooting at longer distances requires more careful zeroing and taking into account variables such as elevation and temperature. Typically, you must measure the actual speed of your bullet in your rifle. You’ll also need the bullet’s ballistic coefficient and height of scope over bore, and you can factor in elevation, temperature and barometric pressure. For the Rapid-Z I input all this into Zeiss’s ballistics calculator, and it gives me where I need to be at 100 yards as well as a printout showing the values of the stadia lines. Depending on the bullet and actual velocity, the “400” stadia line might be valid for 390 yards with one load and 410 yards with another. Custom turret systems like the Leupold CDS are calibrated for just one load. They are also calibrated for a certain elevation and temperature. These are probably drawbacks: If you switch loads or have major climatic changes, the data will be off. I use sort of “average” elevation and temperature for likely hunting conditions, not where I do my range work. Slight tweaking is thus ongoing, but I’m convinced “dialing up” is the most precise system. Typically, you decide on your zero range, and dialing starts beyond that. I have my CDS turrets set for a 200-yard zero because I think this offers the most flexibility. In the field, I usually hold a bit high as needed out to 300 yards, and I don’t start dialing until the range is farther than that. Regardless of what system you choose—whether stadia lines, custom turrets or drop tables generated by ballistic programs—you need to field check it. For instance, if I start with a height at 100 yards recommended by a ballistics chart or program, I check the zero on paper at 200 yards. Ditto if I have a 200-yard zero and a ballistic program or scope instructions tell me where I’ll be at 300 yards or beyond: I verify the dial or the hashmarks at actual ranges. I actually like to do this at much longer distances than I would ever shoot at game. Knowing that my data is valid out to 800 yards gives me huge confidence for the occasional 500-yard shot.